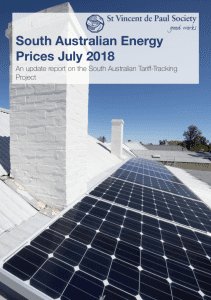 The Vinnies’ Tariff-Tracking project has examined South Australian residential electricity and gas prices since 2009. This update report is based on energy offers available post the 1 July price re-set and it examines price changes, market trends and customer impacts. May is the founding director of Alviss Consulting. May has over fifteen years experience researching and analysing energy markets, regulation and consumer issues in Australia. She has produced extensive analyses of energy prices, market developments, regulatory frameworks, concession arrangements and energy affordability. May holds an MSc in Public Policy from the London School of Economics.